Christmas Dinner Comes Early – Berkeley Mt. Zion M.B.C. On Saturday, December 22 Berkeley Mt. 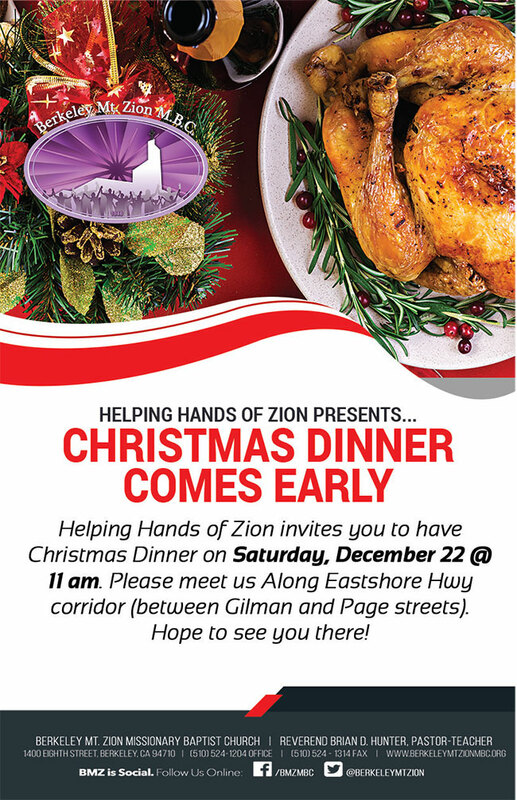 Zion Helping Hands Ministry will hold its annual Christmas Feeding. This is your opportunity to give back to the Berkeley community. We are asking for assistance as we go out into the community to feed those in need. You may sign up for a shift immediately following both 8:00 a.m. and 11:30 a.m. service today, Sunday, December 16. 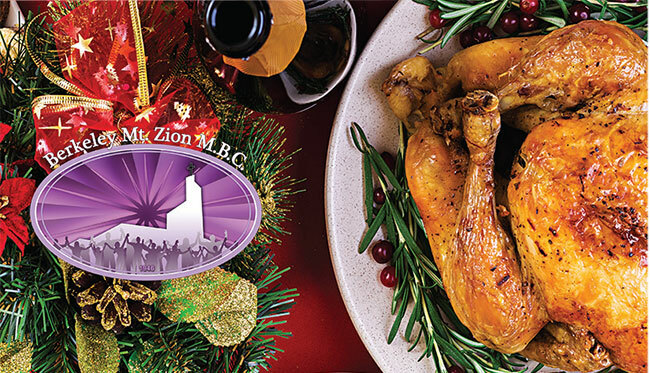 We are asking for COOKED turkeys, hams and desserts, which you can drop off here at the church on Friday, December 21 after 6:00 p.m. We are also asking for items to be able to distribute to those in need. The items are packaged underwear, new socks, and gently worn coats. The Berkeley/Richmond Connection Group, under the direction of Mother Verna Walker, will be hosting a Prayer Breakfast on Saturday, January 12, 2019 @ 9:30a – 11:30a at the South Berkeley Senior Center on 2939 Ellis St. in Berkeley. The theme is:“Calling Forth Wailing Women: Teaching Our Daughters to Pray” Jeremiah 9: 17 – 21. The tickets are $25. Please see a committee member or your Connection Group Facilitator for tickets. Committee Members will be if the vestibule with a signup sheet as well as tickets. Join us for food, fun and the Word. Enhancing the Pastor’s vision for Mary and Elizabeth relationships.